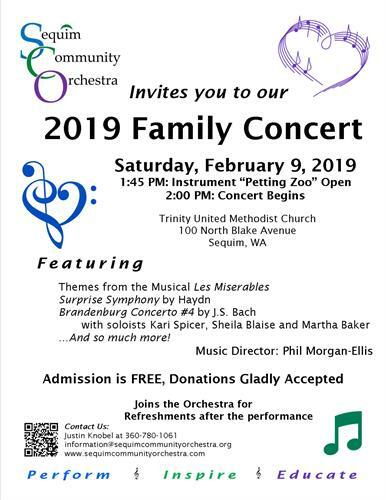 Join the Sequim Community Orchestra for a matinee performance! For the first concert of 2019, we are holding our Family Concert, with an opportunity to see the instruments up-close before the music begins in our Instrument Petting Zoo, and stories about the music and composers for everyone to enjoy. During the concert, the SCO will need the assistance of all the children in the audience in the percussion section, too! At 1:30, the Instrument Petting Zoo begins our day, with the concert beginning at 2:00. Music to include selections from the musical "Les Miserables," Haydn's "Surprise Symphony," and we will end the performance with J.S. Bach's "Brandenburg Concerto #4" with soloists Kari Spicer on violin and Martha Baker, Sharon Blaise, and Grace Yelland on flute. SCO concerts are free to attend, though we gratefully accept your donations at the door. All proceeds are used to keep our SCO String Kids program free for students in Sequim. Plan to stay after the concert for refreshments and a chance to meet the orchestra. With new board members and musicians, this will be a great way to spend an afternoon! Admission is free, though donations are gratefully accepted.